Whether it’s sweltering hot or frigid cold outside, you know there’s one place you can escape Mother Nature’s wrath: your home. But, what if your home was consistently failing to provide that relief? Immediately, the investigation would begin. Well, let our team at Innovative Comfort save you the hassle of trying to play amateur detective. 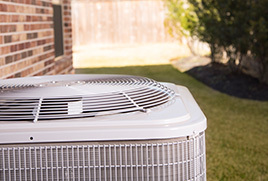 If your system doesn’t need a repair, then chances are your HVAC unit isn’t a good fit—literally—for your home. Let us explain. Common misconceptions may cause you to believe otherwise, but the size of your heating and cooling system does matter. In fact, it’s crucial for its overall performance and efficiency. Do You Want to Get a Little Comfort From a Lot of Effort? A system that’s too small for your home will overwork itself trying to attain the temperature you desire. But the truth is, no matter how much your unit exhausts itself, your comfort demands are just out of its reach. Here’s what happens when your system is too small for your space. Your unit will operate constantly, yet fail to reach the set temperature. Or, if it manages to meet your demands, your unit will run itself into the ground trying to maintain it. As a result, you’ll be faced with high energy bills, an uncomfortable home and the need for a system replacement years before originally planned. There’s nothing comforting about that! Is Bigger Better If It Doesn’t Get the Job Done? Unlike an undersized system, a system that’s too large for your home will reach your desired temperature quickly. On a sizzling hot day, this may sound intriguing, but it’s quite the contrary. Ask yourself this: Would you ever turn your car off while you were still driving? Of course not! Well, essentially, that’s what happens when you operate a system that’s too large for your home. As soon as your oversized unit reaches its set temperature, it shuts off—regardless of where it is in its cycle. This short cycling takes a toll on your system’s wellbeing. But it gets worse. In order to properly dehumidify your air, your system needs to complete a full cycle. So, if your system continuously short cycles, it’ll fail to properly dehumidify your air. This leaves you with a hot and sticky indoor environment—no matter how much you lower the thermostat. A system that’s sized properly for your home will provide maximum comfort, improved air quality and increased efficiency while minimizing the need for unit maintenance, the prevalence of system malfunctions and those high energy bills. With Us, Your Comfort Matters. So, how do you find the perfect system? You turn to Innovative Comfort, of course. Using years of hands-on experience and elite HVAC knowledge, our professionals will thoroughly evaluate the layout of your home and assess your specific comfort demands to determine the right sized system for your home. Your home’s physical characteristics—orientation, ceiling height, number of rooms, number of windows, etc. There is an ideal HVAC unit for every home or business. Using unparalleled expertise, our professionals at Innovative Comfort can help you find that system. To start living your most comfortable life, fill out our online form or call us at 425.361.2526 today!